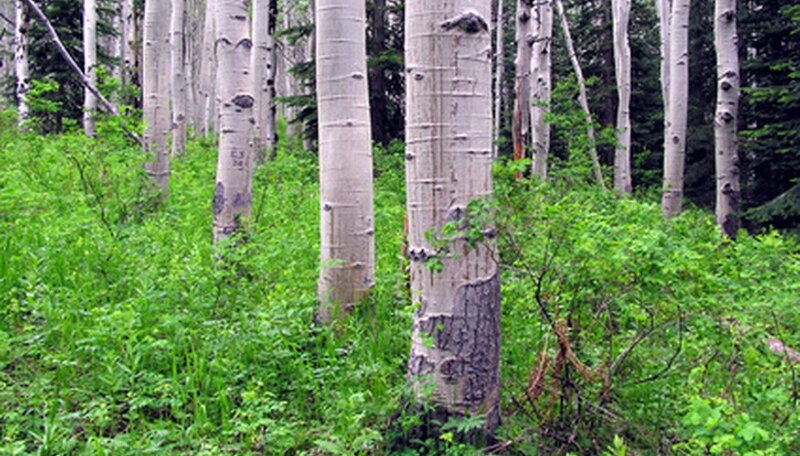 According to Discover Magazine, the quaking aspen tree is the largest organism on the planet. That's because aspen groves share the same root system, which means a single tree is actually small part of a larger living organism. But despite the potential for immense size, an aspen can still suffer the effects of tiny viruses and other afflictions that cause strange growths on the twigs, branches, leaves and bark. These problems are easy to spot and diagnose, because they leave telltale markings behind. Climb a ladder so you can examine the branches of an aspen more closely. If you see orange pimples along the branches, you have found evidence of cytospora canker. Branches that have contracted cytospora canker must be pruned away to prevent the spread of the disease to healthy branches. Pry away a section of the bark of an aspen tree with a grafting knife if it has odd, pin-shaped holes in it. If you see meandering tunnels in the bole of the tree beneath the bark, you have found signs of metallic wood borers or longhorned beetles. Pluck a leaf off of an aspen tree and look at it more closely. Leaves that develop spots are showing signs of early infestations of leaf spot fungus or attacks by leaf miners. If you examine the branches of an aspen tree with spotting leaves, you may find a canker, which is an advanced infection caused by leaf spot. Leaves that turn crispy and brown or grow in distorted shapes are showing signs of leaf blight. Leaves that show tiny rusty-looking spots may be exhibiting signs of leaf rust. If the leaves have odd bulges, they suffer from gall caused by aphids. The gall will not harm the aspen tree. Prune away twigs with distorted shapes from the ends of aspen branches using pruning shears. If the twigs have smooth, knot-like swelling, then they are caused by an infestation of poplar twiggall fly. There is no way to prevent twiggall fly infestation, but the galls are not harmful to aspen trees. Look at the trunk of your aspen on its southwest side. If the bark has patches of red, orange or yellow, or splits, peels and then becomes mushy, the tree is suffering from sunscald. Sunscald strikes younger trees more frequently than older trees. To prevent sunscald, wrap young aspens in winter. Explore the bole of an aspen tree that is shedding its bark. If the trunk beneath the bark looks black, or has striping in a barber pole pattern, it has contracted sooty-bark canker. If the bark remains on the tree, but the trunk develops a circular dead area, the aspen has developed black canker. If the tree shows a depression with an irregular margin and the underside of the bark is mottled black, the aspen has developed hypoxylon canker. Older hypoxylon cankers cause aspens to lose their bark and the bole to crumble.